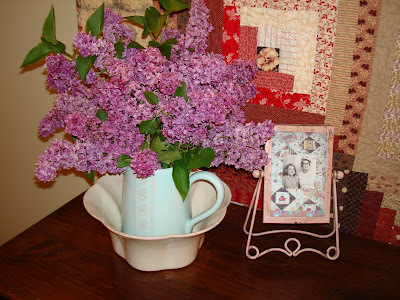 The lilac bushes are blooming everywhere, and in front of the house at my parent's home - so, as I do every year, I cut a bouquet and put them in the entryway so that everyone in the house can enjoy the fragrance and the view of the flowers. (If you see the picture next to the flowers, it is my mom with her mother (Freda). 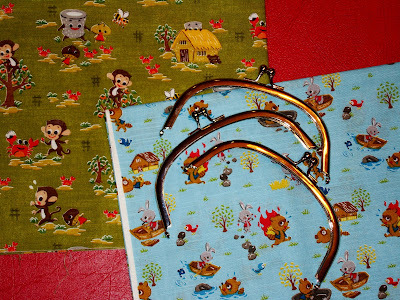 I recently got some great fabric in the mail from Superbuzzy. It views some Japanese fairy tales, due to the strange imagery and they have a CRAZY back story, it you look up the name of the fairy tale on Wikepedia. Sewlola on Etsy. Now its just a matter of finding the proper lining and getting around to putting everything together. So. . . yeah, it should only be a few weeks before I get around to that. Also, as I was knitting this weekend and moving fabric around, I noticed 2 instances of the same type of bug in my stash -- EEP! 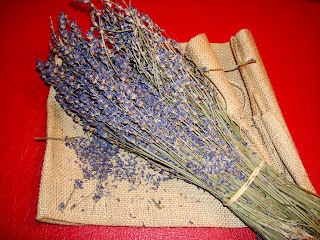 So, I picked up some lavendar and am making some sachets. Right now, I am probably going to use burlap and ribbon for a few, but I might try some more complicated/cute ideas in the near future. Great post! (Loved the knit skirt, too). Thanks a bunch for the purse frame links. I'd like to try that some time. I have just cut some of our white lilac and put it in the porch for exactly the same reason! Great minds think alike! oooo! Lilacs and Lavendar! Two most wonderful flowers.. both smell terrific. Love your post about them. The lavender is beautiful. I love the Japanese fabric. AH! I want to make a purse!! I've been eyeing the tutorial on purlbee for a while now. You girls get the best little japanese-y fabrics! Cute Fabrics! While shopping around for those little purse frames, did you happen to see any with little holes all along the edges? I've been looking but haven't had much luck finding them.